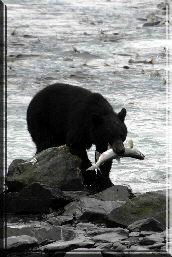 This black bear has it pretty easy, finding the perfect spot for supper. We were in Valdez, AK where the cannery hatches their own salmon fry, releasing them in the spring and then years later, mature fish swim back to the cannery. The waters of The Inside Passage are teaming with thousands of fish, kept from climbing the fish ladder too soon by a weir. All the bear has to do is reach in and grab supper. Could take out be any easier?